Riding the GoToBus from Los Angeles to Oakland, I accidentally watched Rush Hour 3 and The Tuxedo from several strategically placed monitors while listening to the Counting Crows, M.I.A. and Meshell Ndegeocello on my headphones. I discovered that Jackie Chan, muted by a randomly generated soundtrack and offset by a variety of backdrops, is still Jackie Chan, in perhaps the same way Heath Ledger is still remembered as Heath in 10 Things I Hate About You (Modern Shakespearean Heath), Brokeback Mountain (Gay Cowboy Heath), or The Dark Knight (Joker-In-Drag Heath). When I wasn’t accidentally watching Jackie Chan fight somebody, I tried to look at the scenery off the 5, which I wanted to believe was more interesting but was in reality less accessible, and ended up accidentally reading incoming and outgoing text messages on the smart phone of a person sitting diagonally across the aisle. This entire experience—me accidentally looking at the mountains, Jackie Chan on mute, someone else’s text messages; you reading this compiled memory as a paragraph on a blog; followers liking, re-blogging, re-posting, sharing and tweeting this review; and then me importing the HTML into Microsoft Word and putting the whole thing through Google Translate a few times—might actually approach the experience of browsing and forgetting that is assembled in Tan Lin’s HEATH COURSE PAK. plagiarism/outsource Ed. Rev., Notes Towards the Definition of Culture,Untilted Heath Ledger Project , a history of the search engine,disco OS annotated or HEATH, as the project is often referred to, is the revised second print edition of a book authored within a social network. Like following Heath Ledger’s death over the internet—through the rapid replication of speculative information, quotations, paraphrased material, tags and images as they unravel, reproduce and become felt by a social network—Lin’s assemblage of HEATH is a kind of muscle memory for feelings that are erased, re-written, read, scanned and searched repeatedly within a complex system of users, readers, commentators, followers, friends and authors. I love this idea of “everyone wants one’s feelings distributed.” This explains the random periodic urges I have to update my status with song lyrics or carefully crafted phrases of cryptic, emotive density addressed to everyone and no one in particular (except to that certain someone). Lin suggests that “people remain stubbornly difficult to white out in a digital culture, as with YouTube or Facebook where social networks become theatre and text reverts to the oldest form of truncated, telegraphic, obscene, and ephemeral forms: lyric poetry and/or interior monologues directed to a ‘chorus’ of social cohorts.” And if you actually post that cryptic internal poem status publicly (instead of deleting it ten minutes later like I do), the feeling is encrypted (or, as in my case, the feeling desires encryption) and is then parsed out as kind of text product set free into a network for distribution. Does distribution and re-circulation grow the intensity of what we are feeling, or weaken it? Bystanders taking photos with their smart phones and receiving real-time updates gather around an event in the same way reading on the web is outsourced to other parties, followers, commentators and friends. A library is assembled and a search engine sifts through incoming entries—sorting, categorizing and tracking hits. What is felt (what there is to be experienced) is, from the get-go, already in distribution, written about and re-posted. This is the choreography within which HEATH as a work participates. HEATH is an event. A social network. A reading environment. A theater. A program. A system. A performance. HEATH is a distributed feeling. What I think is most exciting about HEATH is how it proposes text as event, text as theatrical space, and authorship as acting. In our language-saturated moment (email/text/app), everything we see on the web is language—program codes, core codes, scripting languages. As Lin acknowledges, “Heath: he exists as a kind of format-dependent scanning, as does the work itself. So I think it’s useful to think of language here, but perhaps assembly languages, source codes, and/or compiling languages, etc.-something in a dynamic processing environment.” Everyone is constantly engaged in processes of self-description and text making and updating/upgrading. The self turns into an RSS feed, an evolutionary writing/text production (i.e. subjectless process), part of an environment/network. More and more people are experiencing events as a network of emotions and news feeds, citations and recycled, quoted material, where everything is time-stamped and tagged with GPS coordinates, and where our likes are public, shared and distributed. Maybe it is once the feeling is disseminated (once the feeling becomes an event) that it actually becomes felt, by ourselves and by others? HEATH as a book is not really a book, but the print conversion of a network. Heath Ledger performs inside the network, as do other players and pronouns, and is produced by us as we read. 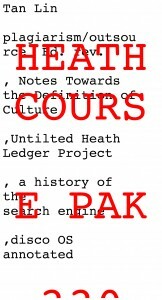 Amidst the wealth of other things HEATH could be, do or suggest, it also erases/forgets itself, links out and asks its followers to write within its text, on its text and about its text; it asks to be abridged, annotated and re-published. It absorbs everything and disseminates everything, yet often has difficulty remembering itself. Which is what the event/network of reading and writing is: a “human memory system in a feedback loop (literature), i.e. it was about erasure more than remembering.” Or “writing as a medium for the exchange or dissemination of something else.” Or “a distribution platform, though we like to call it poetry.” And now that Facebook is asking us “How are you feeling?” perhaps we should be asking Facebook the same question. I mean, how does the network feel? they were correspondences. they were oceanic with pencils marking them up into feed.